NEW YORK (CNN) -- Billionaire oil man T. Boone Pickens is shelving plans to build the world's largest wind farm. 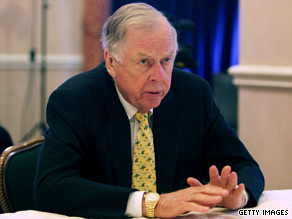 T. Boone Pickens says the capital markets will not support his plans to build the world's largest wind farm. The chairman of BP Capital Management announced Tuesday that his plans for the Pampa Wind Project, designed to generate 4,000 megawatts of electricity using thousands of wind turbines, is on hold. "I had hoped that Pampa would be the starting point, but transmission issues and the problem with the capital markets make that unfeasible at this point," Pickens told CNN's Ali Velshi. "I expect to continue development of the Pampa project, but not at the pace that I originally expected." The Pickens Plan was an attempt to wean the United States off foreign oil and switch to wind and natural gas. The project was to be set in four Texas Panhandle counties. Pickens said he faced hurdles in routing the power from Texas to a distribution system. His plans were also stymied by a plunge in natural gas prices and a tightening credit market. He said he was still committed to 667 wind turbines that he has already ordered and would find homes for them. The Texas billionaire pushed The Pickens Plan in television commercials and lobbying efforts that started last summer. Pickens had hoped to complete his $12 billion plan in 2014 and provide enough electricity to power 1.3 million homes. Renewable energy is the source of only a small portion of electricity used today, but in 2008, the United States became the world's leading provider of wind power. Pickens, 81, made his fortune in oil production and trading and is listed in Forbes magazine as the 117th richest person in the United States with a net worth of about $3 billion in 2007.